In Part 1, I explained how we’d accidentally discovered naturism on one of our first holidays together as a couple. In Part 2, I’m going to continue our unfolding adventure. At the time we were still using a Polaroid camera that produced instant photos, we were still pre-digital back then, so we took photos of each other after the swim, not the first naked photos we’d taken of each other, but the first in a public environment. We’ve tried to replicate those first photographs within Second Life (below). Yes, we did keep our helmets on to remain anonymous, lol. Not every night on that holiday was spent at a naturist campsite, sometimes it just seemed too far to ride in a single day to reach one, but about half of the remainder of the holiday was spent on naturist campsites, and we spent our first day on a naturist beach on that same trip. A couple of years later we got married and then children came along, by which time we were pretty committed naturists at home and abroad. In the period before the kids were born we’d set off on the bike and had usually picked a place where we could probably get a naked swim or sunbathe in. 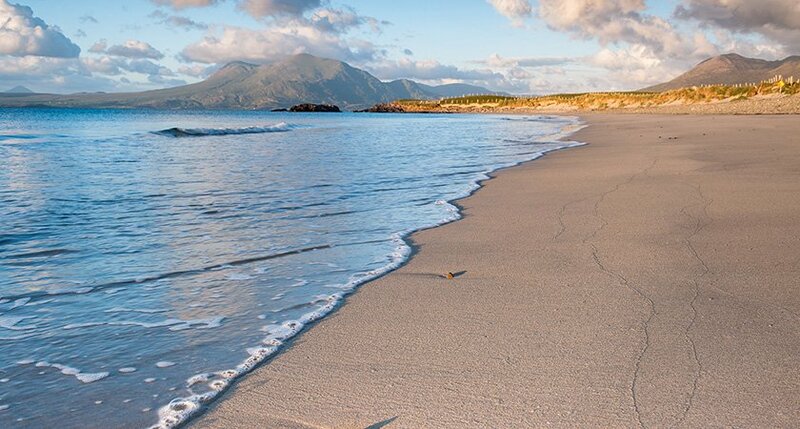 While the weather may be against us often, Ireland is a potential naturist paradise when the sun shines. Wheel the bike into this field, park it against the tree and walk down to a beach where you can almost certainly use it, undisturbed, for hours on end. Co. Galway, Renvyle Beach. If using this for a skinny dip you could see someone coming half a mile away and cover up if you thought it likely you’d offend anyone’s sensibilities. Co. Donegal. The trick is to go midweek. You might have this place to yourself for the entire day once a few dog walkers have used it in the morning. Once the kids came along, though, we needed something better suited to family life than a motorbike, so we bought a camper van instead. It’s not as convenient as the bike, but there’s two willing sets of grandparents who are more than happy to take the kids for the most of a day (they’re in their mid-teens now, so not much looking after is required) while Mary and I still stick our leathers on and head off on the bike like we used to. After many happy naturist holidays with them in France, and weekends at home, they’ve now sadly reached that body-conscious teenage where the idea of going naked themselves, or seeing Mum and Dad go naked horrifies them. Happily for Mary and me they’re all off to a summer camp this year, so I’m currently getting the camper van spruced up for two weeks in which we plan to your as much of Ireland’s coastline as we can, skinny dipping, naked camping and sunbathing (weather permitting) as we can!